When one comes across the work arising from the insights of Rudolf Steiner, one can decide that this work deserves support, and this support can be offered by joining the Anthroposophical Society in the country where one lives. This step is similar to joining any civil organization that promotes a particular cultural impulse (e.g., National Geographic Society, PETA, ACLU, or NRA). It entails an annual financial contribution and nothing more. There are branches all over the world of the Anthroposophical Society, which has its headquarters at the Goetheanum in Dornach, Switzerland. One can also decide that, rather than merely supporting anthroposophical work, one wants to represent it, to take a public stance as a practitioner of the meditative and spiritual path indicated, and in that sense as a student of Steiner’s body of work. 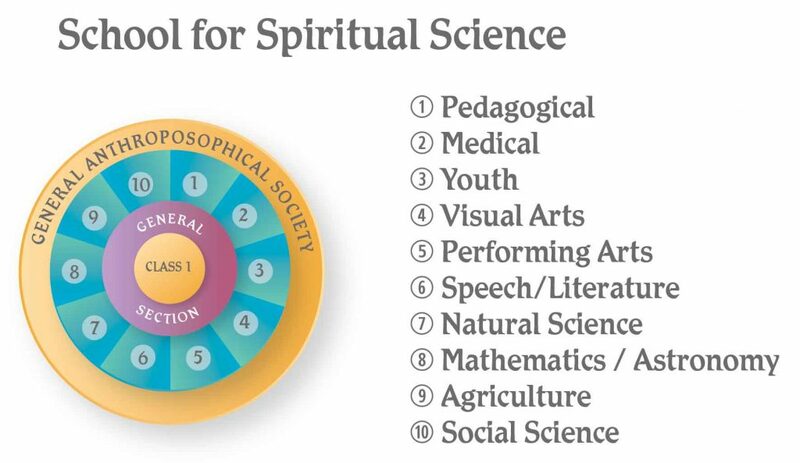 This step is taken by joining the First Class of the School** for Spiritual Science. [ditto for the Class.] The Class, one of three originally planned by Steiner (but the only one he managed to establish before his death), consists of nineteen lessons that are each structured around a set of meditations. The lessons are read or freely rendered by local Class holders in many parts of the world. They give imaginations of the soul’s path of spiritual development. By joining the Class, one automatically becomes a member of the General Section of the School for Spiritual Science. In addition, one can then join with other Class members working in the same field of interest or profession to form research sections exploring the relevance of the Class materials to that particular field, and to utilize those materials in order to stimulate further research. In addition to the General Section here are ten such specialized Sections of the School, the Pedagogical Section being one of them. All of the Sections are headquartered at the Goetheanum and may be regionally coordinated and led by local Councils. The Pedagogical Section Council of North America is, thus, the coordinating and leadership group for the Pedagogical Section in North America.